Over the past few years, Coach Chuck Scheinost and the George Washington University Men’s Golf team have become part of the Salute Military Golf Association family. They have offered the SMGA so much, so far, but their new campaign takes their dedication to another level. GW Men’s Golf has created the Warrior Tribute project, which will honor five SMGA members, one at each of the team’s fall tournaments, as a way of thanking every Warrior Golfer for their sacrifices. The team will carry a bag with the GW and SMGA logos, with a different player having an opportunity to use it each week. That event’s selected SMGA member will have their name as well as items that represents him or her, like branch insignias or military decorations, placed onto the bag before the tournament. At the end of the season, there will be five names and five items on the bag, which the team will auction off, with all proceeds going to the SMGA. The partnership between the SMGA and GW Golf began in 2014, shortly after the start of Scheinost’s tenure as head coach. He and SMGA President Jamie Winslow, an alumnus and four-year golf letter winner at GW, thought the two programs could learn from each other. Since then, the team has taken an active role in the Warrior Golf Clinics, and has played a team of Warriors in the Ryder Cup-style Colonial Cup each year. Since Scheinost and his team spend so much time on the road competing, they wanted a way to help when they cannot make it to Olney Golf Park for a Saturday clinic. And so the Warrior Tribute was born. GW will honor a member from the SMGA chapter closest to that week’s event, to make sure interested Warrior Golfers can get involved and offer support to the team. The Colonials’ season opener will take place at the Air Force Falcon Invitational from September 8th-10th. 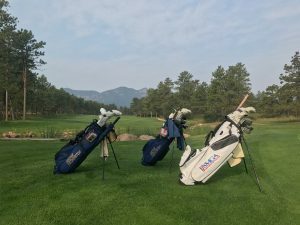 The SMGA’s Fort Carson chapter is just down the road from the Air Force Academy, and Sgt. Brandon Adam, a recent graduate of the Warrior Golf Clinics at Fort Carson, will be the first member recognized by the team. The Salute Military Golf Association’s mission is to provide rehabilitative golf programs, experiences, and family inclusive golf opportunities for post 9/11 wounded war veterans in an effort to improve the quality of life for these American heroes. Eligible veterans and service members include those wounded or injured in post 9/11 military operations, including those with Post-Traumatic Stress Disorder (PTSD) and/or Traumatic Brain Injury (TBI).